the data that you need. But what can you do if you want to get the report as image file ? SiteShoter utility can help you do that. SiteShoter is a utility that allows you to save any Web page or HTML file into image file(png/jpg/gif). Simply type the html file path in the URL field, choose all other parameters according to your needs, and then click the start button. 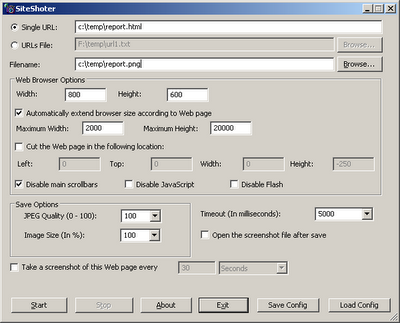 It also recommened to set a low timeout value, because HTML files (As opposed to Web sites) are loaded pretty fast. If everything works fine, the image of your HTML file should be created in the location you specified in the ‘Filename’ field. For more information about SiteShoter, click here. Posted by NirSoft on April 27, 2009 at 2:28 am under NirSoft Tips. WebVideoCap: Fixed bug – WebVideoCap crashed on some mms/RTSP streams. VideoCacheView: Added /copyalltemp and /copymms to command line, and fixed Windows 7/Vista bugs. NirCmd: Added loop command, currtime and currdate variables. Mail PassView: The accounts of Windows Live Mail are now also displayed if you changed the store folder location. WhatInStartup: Added ‘Execute Command’ and ‘File Properties’ options. SpecialFoldersView: Added ‘Folder Properties’ option, and ‘My Documents’ folder that I missed in the previous versions. DLL Export Viewer: Added support for Drag & Drop and for ‘Open With’ menu/dialog-box of Windows. WhoisThisDomain and WhoisCL: Updated the whois server of .ms domains. Posted by NirSoft on April 26, 2009 at 2:51 am under Utilities Update. The new version of VideoCacheView now allows you to easily save all flash videos currently opened in your Web browser, even without displaying any user interface. You can use this feature with most popular video sharing Web sites, like YouTube, iFilm, Metacafe, and so on. If you download and install VideoCacheView with full installation support (VideoCacheView_setup.exe), the “Save All Opened Flash Videos” shortcut is automatically created in programs group of VideoCacheView. opened flash videos are saved into the folder that you selected. Posted by NirSoft on April 23, 2009 at 2:39 pm under NirSoft Tips, Utilities Update. CurrPorts: Added drag And drop icon in the toolbar that allows to to easily filter by the desired application. Simply drag the target icon into the window of the application, and CurrPorts will display only the opened ports of this application. OpenedFilesView: Added drag And drop icon in the toolbar that allows to to easily view only the opened files of the desired application simply by dragging the target icon from the OpenedFilesView toolbar into the application. Also Added processfilter command-line option. WhoisThisDomain and WhoisCL: Updated the whois servers for .is, .lt, .ma, .md, .pl, .si, and .sk domains. 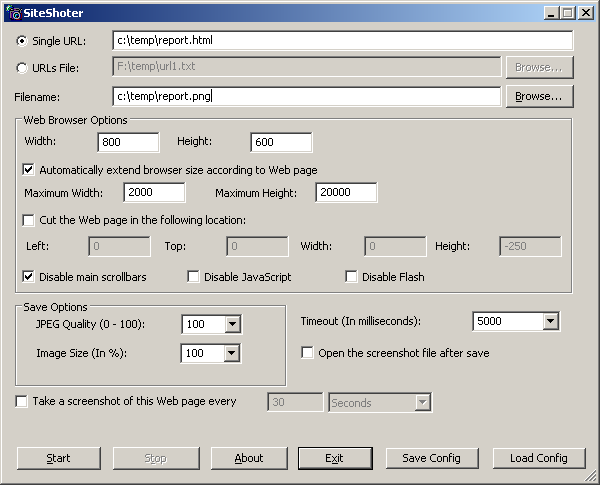 SiteShoter: Fixed bug – SiteShoter failed to create screenshots of very large Web pages when there was not enough memory in the video card. SiteShoter now uses the computer memory instead of the video card memory. IconsExtract: Fixed bug – The size of PNG based icons is now displayed properly. (In prevoius versions, the size was displayed as 0x0). SysExporter: Added ‘Remove Question Mark Characters’ – Useful for date/time and some other columns of Explorer in Windows Vista. Posted by NirSoft on April 19, 2009 at 1:58 pm under Utilities Update. Windows operating system have around 40 unique locations in the file system known as the “Special Folders”. Many people are confused about that location of the special folders, because the location of these folders is modified from one version of Windows to another. For example: In Windows 98, the history folder was located under c:\Windows\History, In Windows 2000/XP Microsoft changed it to C:\Documents and Settings\[User Name]\Local Settings\History and now in Windows Vista, it’s located under C:\Users\[User Name]\AppData\Local\Microsoft\Windows\History. That’s why I created the SpecialFoldersView utility. This utility shows the list of all special folders in your current Windows operating system, and allows you to easily jump to the desired folder. Posted by NirSoft on April 19, 2009 at 3:01 am under Utilities Update. For long time, I maintain a list of all WHOIS servers that can be used for getting domain information of generic domains (like .com and .org) and country code domains. This list was internally used in WhoisThisDomain and WhoisCL utilities, But until now I have never published this servers list as a standalone file. This servers list is now available to download from this page, and it’ll be updated every time that there is a change in the internal servers list of WhoisThisDomain and WhoisCL utilities. Posted by NirSoft on April 18, 2009 at 2:45 am under Utilities Update. New utility to test your download speed. multiple URLs that you choose. It automatically downloads from the desired URLs, one after another. Each download stops after the specified number of seconds has been elapsed (The default is 20 seconds) or after downloading the specified amount of KB. The download speed is displayed in KB/Sec as well as in Mbps. You can easily save the test result into text/csv/xml/html file. Posted by NirSoft on April 16, 2009 at 2:23 am under Utilities Update. A new utility in NirSoft Web site, WhatInStartup, displays the list of all executable files (.exe) that automatically run when Windows starts up, and allows you to easily disable or delete them completely. This utility replaces the old StartupRun utility, which haven’t been updated for more than 4 years. instance of Windows, and disable/delete unwanted programs that runs at startup. Permanent Disabling: Many programs add themselves into the Windows startup list without even asking you, and even if you disable or delete them, these programs add themselves again in the next time that you use them. While WhatInStartup is running, it monitors the startup lists in the Registry and in the file system. If a disabled program added itself again into the list, WhatInStartup detect the change and automatically disable it again. This means that as long as WhatInStartup is running, the programs that you disabled won’t return back to Windows startup. For more information about WhatInStartup utility, click here. Posted by NirSoft on April 7, 2009 at 2:42 am under Utilities Update. ChomeCahceView and OperaCacheview: Added new option in ‘Copy Selected Cache Files’: Update the modified time of the copied files according to modified time in the Web server. PingInfoView: Added ‘Last Succeed On’ and ‘Last Failed On’ columns. Also, the % Failed value now shows the value in accuracy of 0.01% instead of interger values in previous versions. Posted by NirSoft on April 4, 2009 at 2:32 am under Utilities Update. Cause your computer to speak – from command-line. NirCmd utility has a new ‘speak’ command that allows you to easily cause your computer to speak the text that you wish. In this command, NirCmd uses the Speech library (SAPI) that is installed with any instance of Windows XP and Windows Vista. The speak command is not the most useful command in NirCmd, but it’s a nice and funny addition for April Fools’ Day. Be aware that Windows XP comes with a default “robotic” voice known as “Microsoft Sam”, while Windows Vista provides much better woman voice, known as “Microsoft Anna”. Posted by NirSoft on April 1, 2009 at 2:27 am under NirSoft Tips, Utilities Update.